Production: Warner Brothers, Elmer Enterprises; Technicolor; Panavision; running time: 109 minutes. Released July 1972. Producer: John Boorman; production manager: Wallace Worsley; screenplay: James Dickey, from his own novel; assistant directors: Al Jennings, Miles Middough; photography: Vilmos Zsigmond; 2nd unit photography: Bill Butler; editor: Tom Priestley; sound editor: Jim Atkinson; sound recordist: Walter Goss; sound rerecordist: Doug Turner; art director: Fred Harpman; music: "Duelling Banjos" arranged and played by Eric Weissberg, with Steve Mandel; creative associate: Rospo Pallenberg; special effects: Marcel Vercoutere; technical advisers: Charles Wiggin, E. Lewis King. Cast: Jon Voight ( Ed ); Burt Reynolds ( Lewis ); Ned Beatty ( Bobby ); Ronny Cox ( Drew ); Billy McKinney ( Mountain Man ); Herbert "Cowboy" Coward ( Toothless Man ) James Dickey ( Sheriff Bullard ); Ed Ramey ( Old Man ); Billy Redden ( Lonny ); Seamon Glass ( 1st "Griner" ); Randall Deal ( 2nd "Griner" ); Lewis Crone ( 1st Deputy ); Ken Keener ( 2nd Deputy ); Johnny Popwell ( Ambulance Driver ); John Fowler ( Doctor ); Kathy Rickman ( Nurse ); Louise Coldren ( Mrs. Biddiford ); Pete Ware ( Taxi Driver ); Hoyt T. Pollard ( Boy at Gas Station ); Belinda Beatty ( Martha Gentry ); Charlie Boorman ( Ed's Boy ). Dickey, James, Deliverance , Carbondale, Illinois, 1982. Piccardi, Adriano, John Boorman , Florence, 1982. Streetbeck, Nancy, The Films of Burt Reynolds , Secaucus, New Jersey, 1982. Ciment, Michel, John Boorman , Paris 1985; London 1986. Gow, Gordon, in Films and Filming (London), February 1972. Variety (New York), 19 July 1972. Strick, Philip, in Sight and Sound (London), Autumn 1972. Milne, Tom, in Monthly Film Bulletin (London), September 1972. Ciment, Michel, in Positif (Paris), October 1972. Allombert, G., in Image et son (Paris), November 1972. Grisolia, M., "L'Amerique s'est dissociée de la nature, par un sort de névrose commune," interview with John Boorman in Cinéma (Paris), November 1972. Dempsey, M., "Deliverance/ Boorman: Dickey in the Woods," in Cinema (Beverly Hills), Spring 1973. Armour, Robert, " Deliverance: Four Variations of the American Adam," in Literature/Film Quarterly (Salisbury, Maryland), Summer 1973. Willson, Robert F. Jr., " Deliverance from Novel to Film: Where Is Our Hero?" in Literature/Film Quarterly (Salisbury, Maryland), Winter 1974. "Boorman Issue" of Positif (Paris), March 1974. Dunne, Aidan, "Labyrinth of Allusion," in Film Directions (Belfast), vol. 1 no. 4, 1978. Combs, Richard, "Male Myths," in The Listener (London), 4 July 1985. Griffith, J. J., "Damned If You Do, and Damned If You Don't: James Dickey's Deliverance ," in Post Script (Jacksonville, Florida), Spring-Summer 1986. Williams, Linda Ruth, "Blood Brothers," in Sight & Sound (London), September 1994. Suarez, E., " Deliverance : Dickey's Original Screen Play," in Southern Quarterly , no. 2/3, 1995. Atkinson, M., "Jon Voight in Deliverance ," in Movieline (Escondido), May 1996. Worsley, W., "Worsley's Year of Deliverance ," in DGA Magazine (Los Angeles), no. 2, 1997. In the early 1970s, accelerated no doubt by Watergate, the optimistic liberal tradition was in some crisis. Conspiracy and paranoia had become common currency in popular culture, a trend evident in such otherwise diverse films as Peckinpah's Straw Dogs , Pakula's The Parallax View , Coppola's The Conversation , and Boorman's Deliverance. Where ten years earlier movie protagonists routinely triumphed over adversity, the heroes of these and other 1970s films were increasingly to find themselves trapped and destroyed by the relentless logic of events. This is the claustrophobic plight of Deliverance's four central characters: a group of urban men caught in an escalating series of violent confrontations with the Appalachian wilderness and its (to them) alien inhabitants. Carried along by the very linearity of the narrative's voyage structure (the four are canoeing down a wild river before it is dammed to form a lake) we directly experience the constraining force of events in the movie's unremitting emphasis on physical detail. Fat Bobby, struggling in the dirt, groped and fondled at some length before he is forcibly buggered; the close-up sight and sound of an arrow pulled from the body of his attacker; the frenzied scrabbling of the group as they dig a grave with their bare hands; the viscera hanging from the wound in Lewis's leg; Drew's body trapped against a boulder, his arm impossibly twisted behind his head. Such scenes are constant reminders of the brute materiality of this wilderness and of the quartet's inability to do anything but react to a succession of real and imagined provocations. Even after their deliverance, Ed wakes screaming, haunted by the fear and guilt embodied in his nightmare image of a hand emerging from the lake. As the credits roll, he lies in bed, unable to sleep. At this level Deliverance is a pessimistic and absorbing piece of story-telling. But it is also more than that. In charting the collapse of "civilised" values, the film invokes larger, almost metaphysical themes. 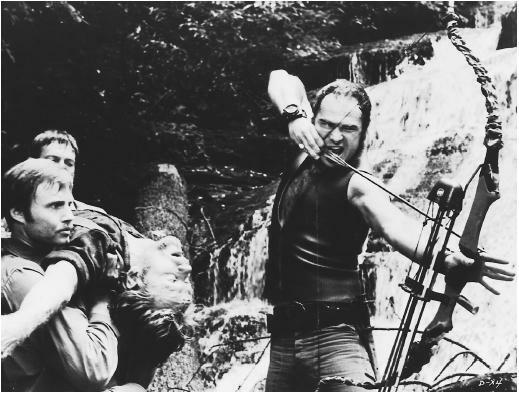 While they are never simply emblematic, Deliverance's four central characters do represent different aspects of the failings of civilised society, failings crystallised in their confrontation with the wilderness. "There is something in the woods and the water that we have lost in the city" opines Bobby, the brash salesman. "We didn't lose it," Lewis replies, "we sold it." Happily, any tendency to promote a mystic commitment to Nature over Civilisation (all too apparent in Boorman's later ecological parable, The Emerald Forest ) is undercut by the fact that Lewis, the self-proclaimed survivor and man of the wilderness, is never elevated into the kind of sub-Nietzschean superman found in, say, The Deer Hunter. Instead, he serves as a foil to the other three, and especially to Ed, whose self-image as a decent, pipe-smoking family man is progressively eroded as the world proves more intractable than he could ever imagine. In the end, though, he does survive, forced to kill and lie to do so. Significantly, it is Drew who dies, his simple belief in the goodness of human nature (exquisitely expressed in his guitar and banjo duet with the moon-faced child and in his evident disappointment when the boy subsequently ignores him) an inadequate defence against a malevolent world. The film's downbeat mood is sustained in its cinematography as well as its dramaturgy. Seeking to lend what he called an "ominous quality" to the "pleasant and restful" greens and blues of sky, river and trees, Boorman (in conjunction with Technicolor) developed a new color desaturation technique for Deliverance. The result is a film shot in threatening grey-greens, not so much washed-out as evacuated of conventionally pretty nature imagery. Although the big Panavision images of river, cliffs, and forest are impressive enough (there are some breath-taking moving compositions of the two canoes, exploiting both the format and the long lens's flattened perspective) the desaturated color always ensures that they do not become merely picturesque. As befits a story of liberal complacency confronted by brutal antagonism, it is the struggle to survive that predominates, the big screen used more to document that in close-up than to celebrate the pictorial splendours of the setting. When the survivors emerge from the last rapids onto the lake, it is not—as it might have been—a comforting expanse of calm water that greets them and us. It is the rusting bulk of a wrecked automobile, water lapping around its fender. Bobby splashes through the shallows towards it. "We've made it, Ed," he cries, grateful for this equivocal symbol of civilised society. It is an appropriately two-edged image in a film which, to the last, refuses to accept that there are simple solutions to the moral dilemmas that it poses.